This article demonstrates the utilization of exfoliated graphene (GR) for fabrication of conductive PLA/GR nanocomposites which are characterized by using XRD, FESEM and impedance analysis. Optimum loading is found to be 1.7 wt% GR when the impedance is drastically reduced to 105 Ω with respect to pure PLA (1011 Ω). Impedance of the composites is further gradually reduced to 104 Ω range for higher GR loading up to 3 wt%. A new concept of equivalent polymer length is introduced for the impedance behaviour of the composites. Further, the composite films are exposed as sensing element for ethanol detection using state-of-the-art designed sensing platform. However, composite containing 2.5 wt% GR loading shows the most stable conductivity and has been taken as the model composite film which yields good sensitivity and high selectivity for ethanol. Sensitivity is dependent on diffusion of ethanol molecule into the composite which leads to removal of amorphous PLA. In addition, the composite shows reusability of films for at least five cycles, and the results from different composite batches are also found reproducible in nature. The online version of this article ( https://doi.org/10.1007/s00289-018-2494-8) contains supplementary material, which is available to authorized users. 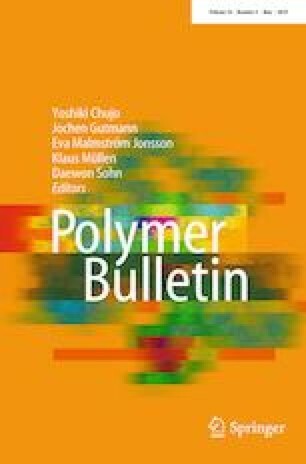 Authors would also like to express their sincere gratitude to the Centre of Excellence for Sustainable Polymers (CoESuSPol) funded by the Department of Chemicals and Petrochemicals, Government of India, and the Central Instruments Facility, Indian Institute of Technology, Guwahati, India, for the research and analytical facilities.